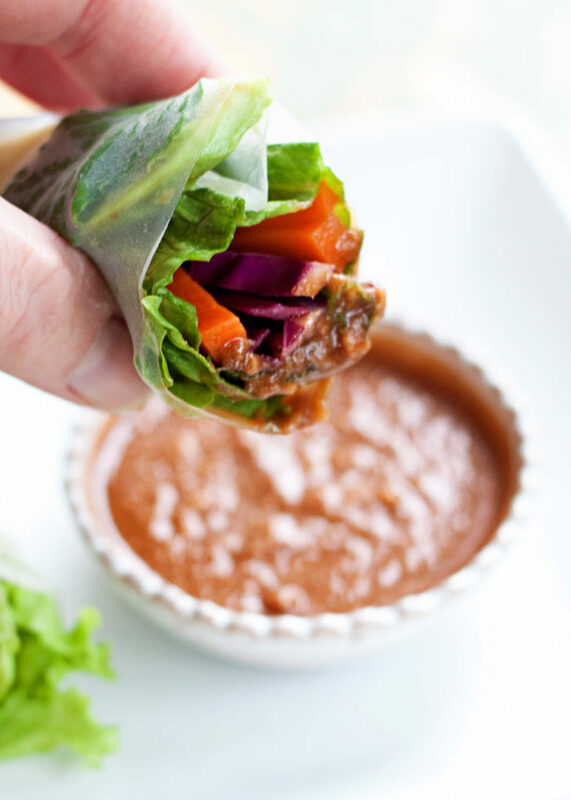 Veggie-packed rolls with avocado, red cabbage, carrots, basil, and mint – all served up with a super easy peanut dipping sauce. Perfect light summer dinner! My favorite color is green. Always has been. Sometimes I’ll prefer a certain shade – my lime phase, for instance, went on for years. Now I guess I’m in more of a mossy zone, but really, just about any green’ll do. 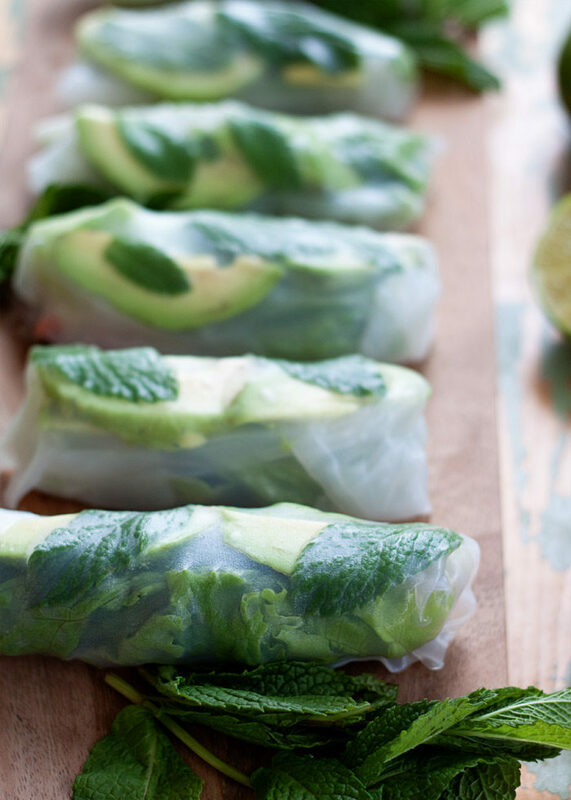 So naturally, I especially love these Avocado Summer Rolls. I mean, hello green! But I don’t just love them because they’re green. I love them because they are super simple to make, bursting with freshness, and nice and healthy to boot. 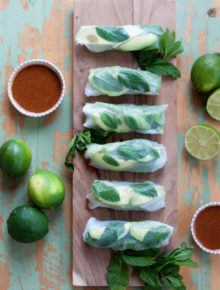 “Green” might also be a word to describe me and my skill level in actually assembling said summer rolls. They’re pretty easy once you get the hang of it, but I’d be lying if I said I didn’t have a few sloppy numbers before I got into the swing of things. Basically, you lay your wrapper out, and you place the mint and avocado just left of center. Then you add your lettuce, veggies, and basil just right of center. 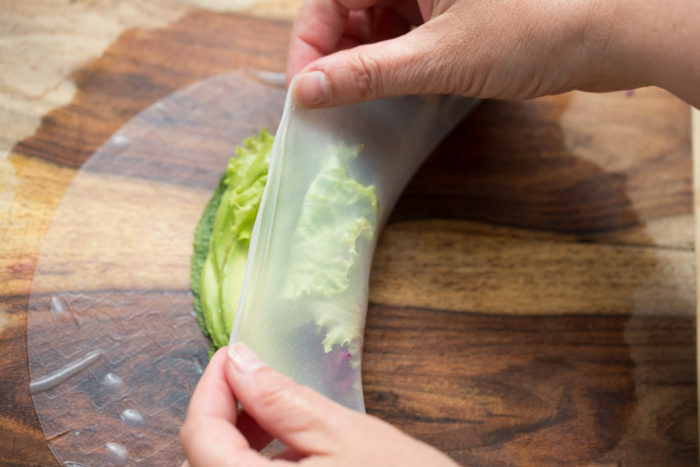 Placing the smaller veggies in a lettuce “cup” helps to keep the roll neater. Then finish by bringing the left side toward the center. 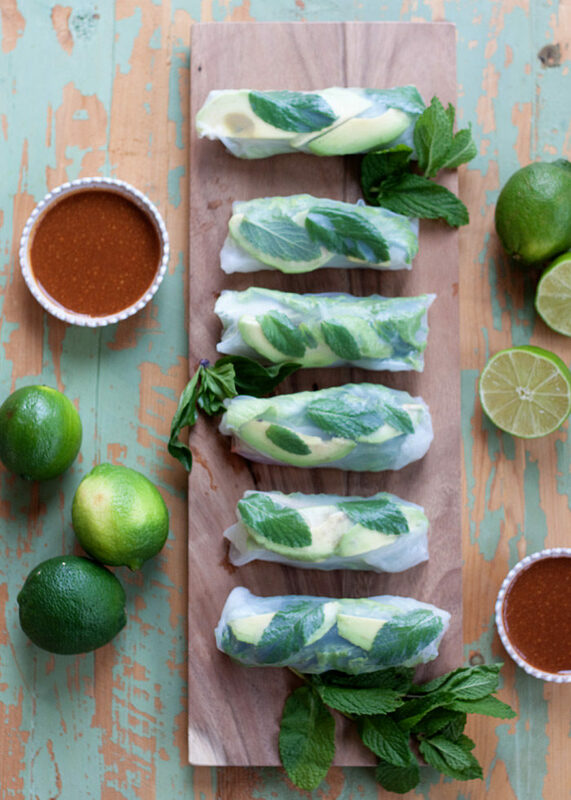 Don’t worry – no matter how sloppy your Avocado Summer Rolls are, they still taste divine. Trust me, I know this first-hand! Creamy avocado. Fresh mint and basil. Carrots and red cabbage lightly pickled in sweet-and-salty rice vinegar. Crisp lettuce. Yesss. Oh, and even though it’s definitely not green, the spicy peanut sauce is a must. In a medium bowl, stir together the rice vinegar, 1 tablespoon lime juice, salt, and honey (or other sweetener). Add cabbage and carrots. Toss. Let sit for about 10 minutes. Meanwhile, make the dipping sauce. To a medium bowl, add the peanut butter, Tamari, 2 tablespoons lime juice, rice vinegar, honey (or other sweetener), and Sriracha. Stir with a whisk 1-2 minutes until creamy. Taste and add additional Sriracha if desired. Set aside. 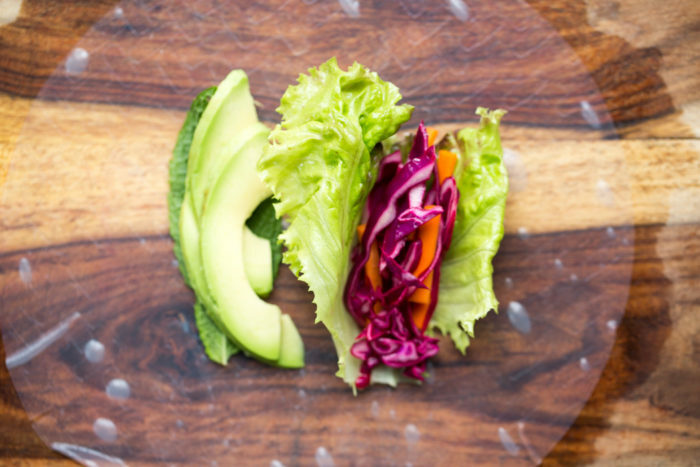 Slice your avocado and prep the mint, basil, and lettuce if you haven’t already. Add about 1/2 inch of warm water to an 8-inch by 8-inch baking dish or a pie pan. 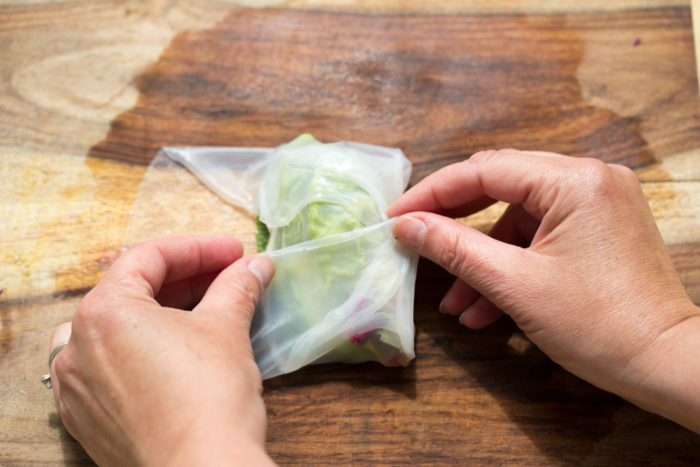 Place one rice paper wrapper in the water and submerge. Let sit for about 1 minute, until soft. 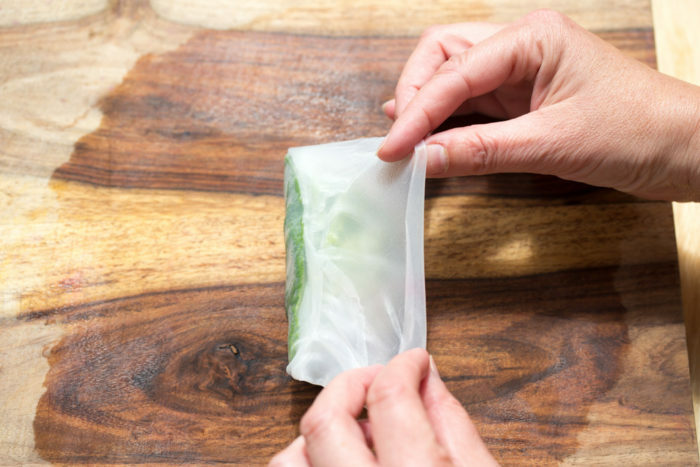 Carefully transfer the rice paper wrapper to your clean kitchen counter or cutting board. At this point, I like to put another rice paper wrapper in the water to soak while I’m assembling so it’s ready to go when I’m done with the previous one. 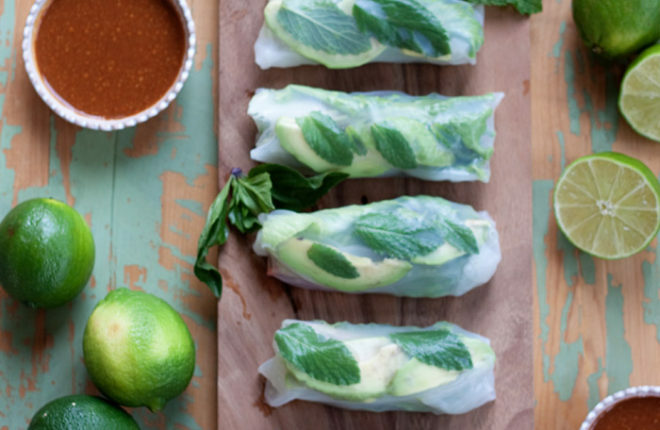 To assemble, place a couple of mint leaves in a short vertical line just left of center, then top with a couple of slices of avocado. 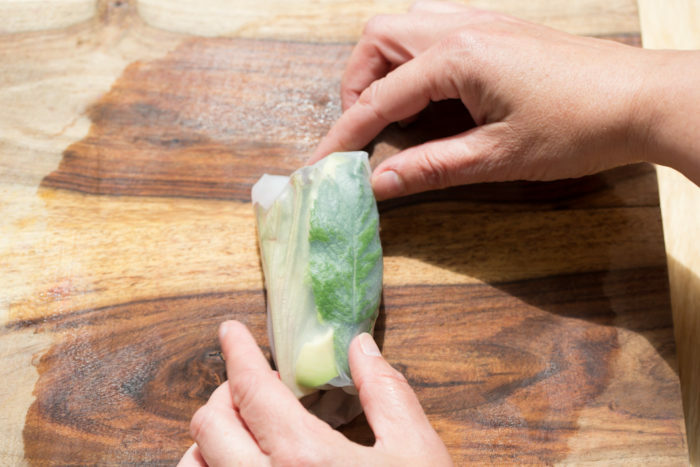 Then, place 1/8 cup or so of the cabbage and carrots inside a lettuce leaf then place the veggies just right of center. Top with two or three of basil leaves. To roll, bring the right side of the wrapper toward the center, then fold the top and bottom in toward the middle. Finish by bringing the left side toward the center, pulling as tightly as you can without ripping. The rice paper should stick to itself and voila! A summer roll! Repeat until all 8 rolls are assembled. 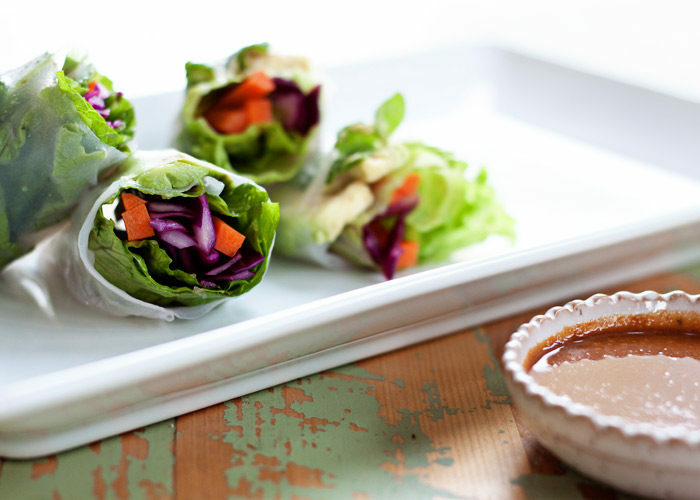 Cut rolls in half, if desired, and serve with the dipping sauce. Use gluten-free Tamari instead of soy sauce. Use vegan granulated sugar, agave syrup, or pure maple syrup in place of the honey. Karen, This dish looks good. looking forward to try it on this Sunday. Hope its perfectly fine for my 10 year old kid? Waiting for your reply. – John! I’ve never seen Thai basil leaves. Should I substitute regular basil?